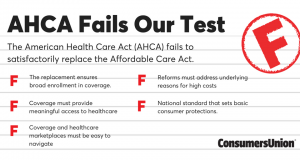 The American Health Care Act (AHCA) today received a failing grade from Consumers Union, the policy and mobilization arm of Consumer Reports. The consumer group sent a dismal report card to House members, along with a letter outlining the many failures of the health reform proposal. The report card comes the day before the House Budget Committee markup is scheduled. 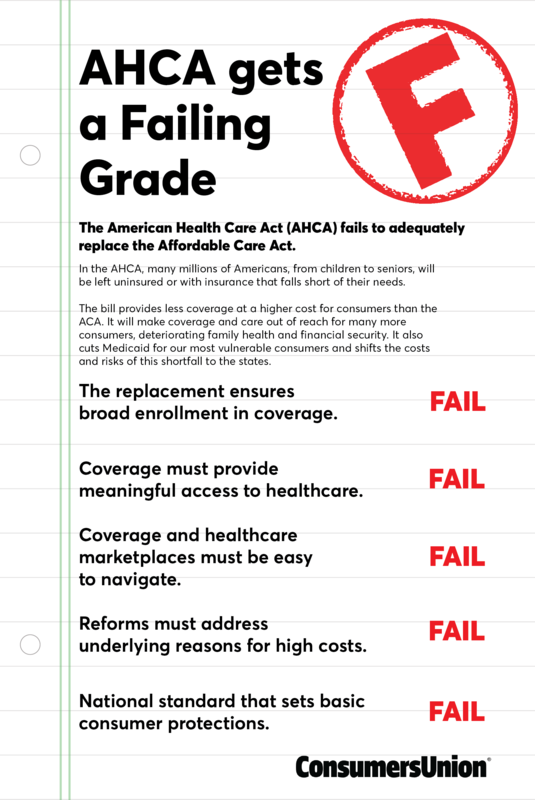 We analyzed the American Health Care Act (AHCA) and have assigned it a failing grade. As proposed, the bill would lead to tens of millions of consumers losing their insurance coverage (with poorer health outcomes and more premature deaths as a result), higher premiums, deductibles and out-of-pocket costs for many others, devastating cuts to Medicaid, and incentives for healthy people to stay out of the insurance market altogether. This is not the future that Americans deserve and is, simply, unacceptable.